Well after looking at several outstanding examples of the above mentioned species I decided to look for my own. We went for an outing today at a local nursery and found what I think is a potential nice bonsai choice. She is in a 7 gal pot with an approx 3+" trunk. So I decided to do a bit of trimming tonight. Last edited by SHS on Mon Mar 01, 2010 6:42 pm, edited 1 time in total. Both of your new acquisitions will make nice material for informal uprights, one of my favorite styles. Good luck with them both. I am also very jealous of all that green grass in the background. Up here we are suffering through the worst Winter in memory and I am going to appreciate that first warm spell in Spring much more so than normal. I remember the winters of Wisconsin and the summers (all two days). The weather down here has been cooler than normal as well, so much for global warming....at least for the last 6 months. I am a fan of the informal upright as well. I guess that is obvious by the raw material I choose. I will periodically update the individual threads as these guys transform from a "bucket bush" to a tree worthy of being called bonsai. Well I did some prunning tonight. Oh and BTW my perception REALLY stinks, the trunk is NOT 3" is is not even a full 2", I guess I was skewed by the size of it all before trimming. Lesson learned, I will measure before opening my trap next time!!! Hi Scott, Nice 'bougie'. Unless you are planning to thicken the trunk don't be afraid to chop way back. They have the amazing ability to sprout back from little stumps, thus creating better taper - when grown in warm climates like yours. I wouldn't try that where I live. Though I do grow them under lights. We had Erik Wigert in Rochester for the First National Bonsai Exhibition. He did amazing things with bougainvillea demos. 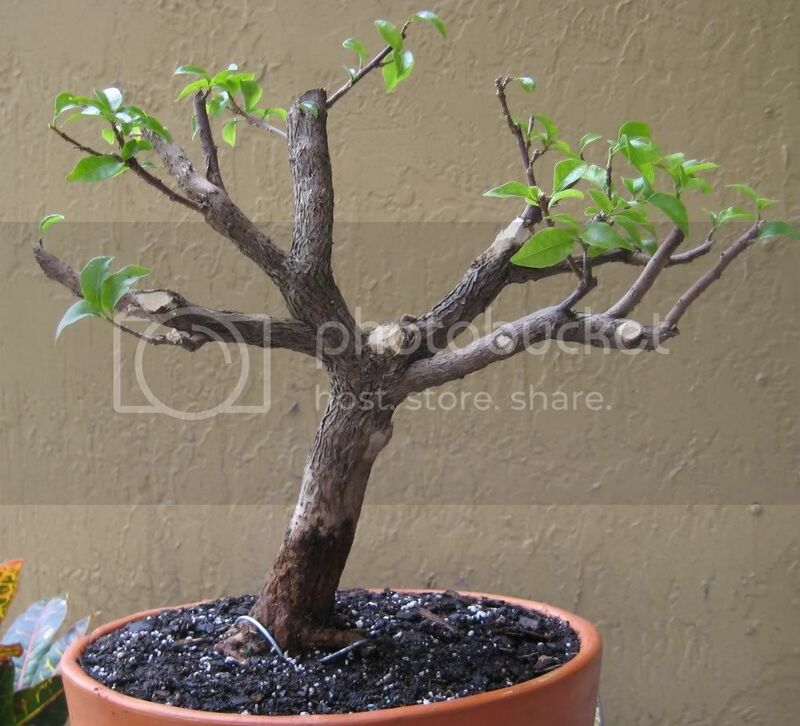 Erik is famed for his tropical bonsai. 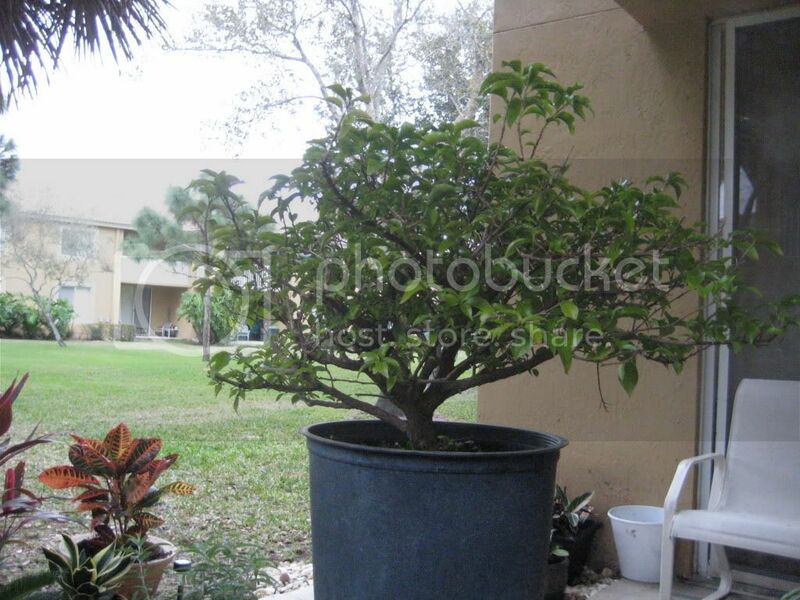 His nursery is in North Ft. Myers and site is www.wigertsbonsai.com. If you can you should take a class/workshop or at least visit. Meanwhile enjoy your trees and thanks for sharing with us. PS - an observation tells me that your tree will soon develop "reverse taper" with all those thick branches radiating from one point on the trunk. That region will thicken more than the lowest part of trunk. You might consider lobbing off the whole top and starting over with 'selected' new branches. Thanks for the link it has some great articles. I did not know I could be so aggressive with this. I plan to go tonight to my first club meeting. I want to buy a few pots right away and hopefully some other items I am having a difficult time finding in retail stores. I trimmed a rather large branch and you can see a bit of the scar at the right side under the branches. I did not get it close enough to the trunk and I think it needs to be shaved back to help prevent reverse taper. 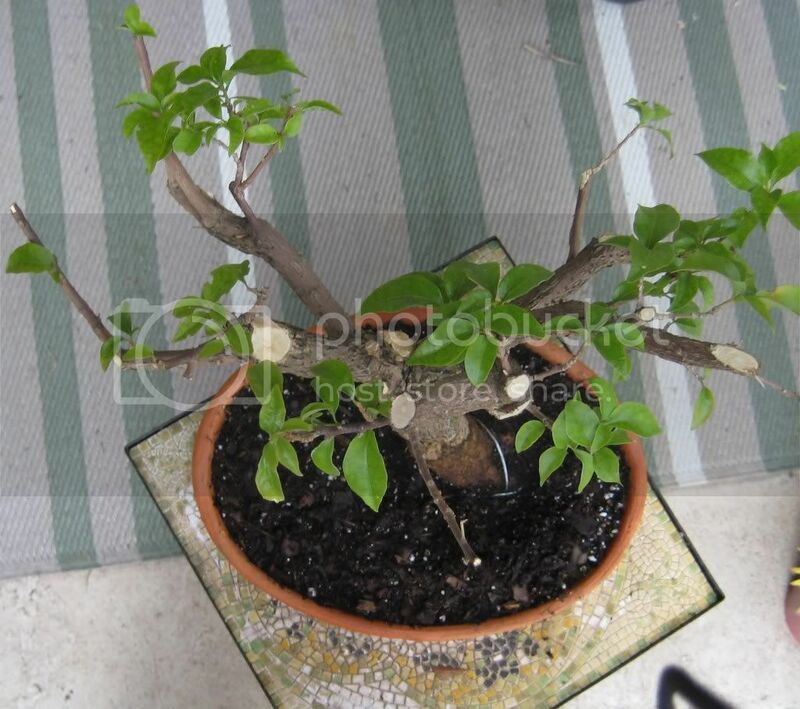 I was wondering if I could take some of the larger branches and expect recovery, good to know and thanks again for the tips. Bring the tree to the club meeting. I know at my club meetings, folks love to look over new material and give advice. Ok, a few questions before I get chop happy. Will it back-bud if I trim below the first bud? (I am speaking of cutting down the limbs closer to the trunk.) I am asking if I can do this to the whole plant at once or do I need to keep at least some green growth at all times? 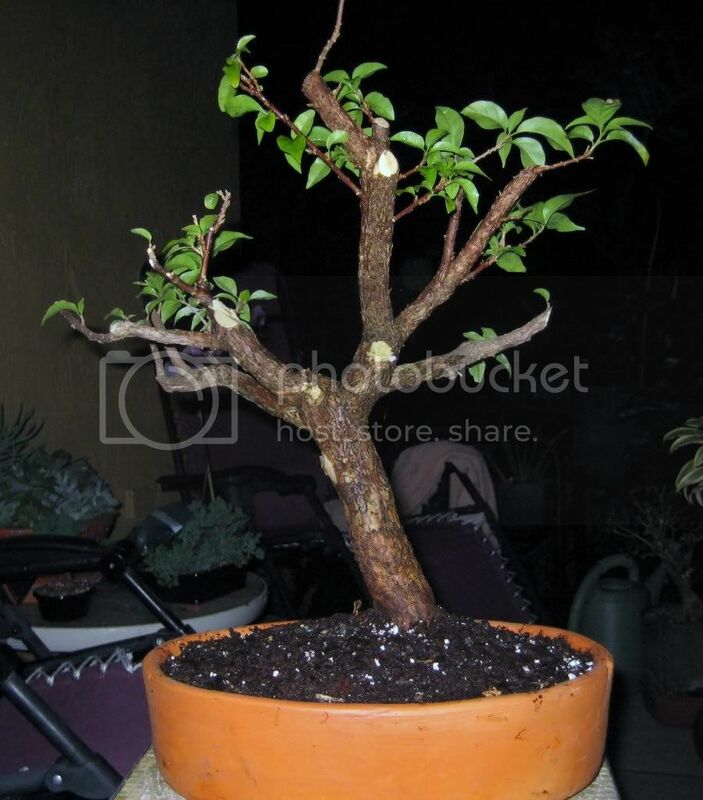 Should I keep it in this pot until it recovers or is it better to go ahead and root trim then put in a bonsai pot? She will be kept outside, at least in the forseeable future. Scott, I agree with Marsman and Gnome. I hope you take your tree to the local club meeting. The club 'elders' (in your area) are sure to have plenty of experience with bougainvillea and should be able to answer your questions and guide you through the early stages of development. I always encourage club membership when feasible. Please report back on anything learned there. We all benefit from the learning experience. I just returned from the meeting and there was very good information to be gained. I brought my Juniper and my Boxwood and it was a workshop in this meeting. I was able to get some one on one instruction from very experienced members. 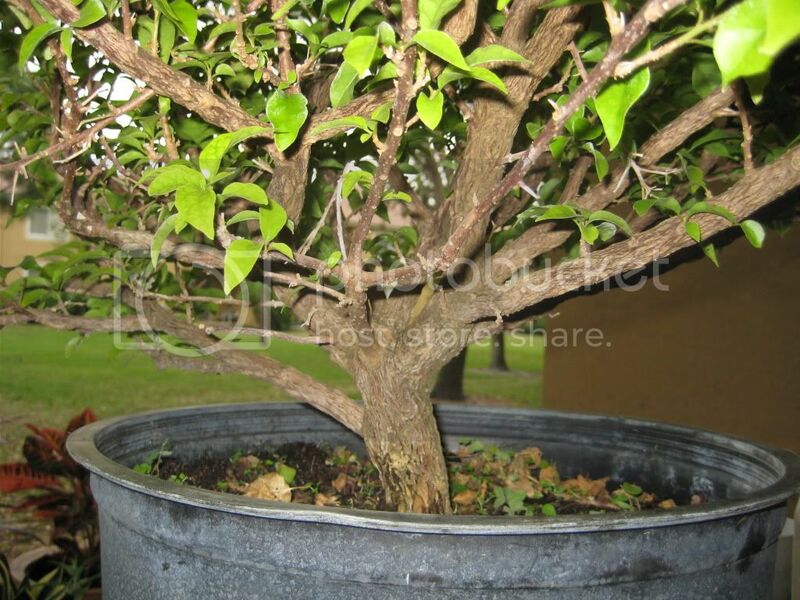 I also asked about the 'Bougie' and as a few of you mentioned it is hardy and able to take major prunning, even back to the trunk. I will look at this more during the evenings this week. I need to study more as well. Some of what I saw followed what was perceived as a strict form over what I would call beauty. 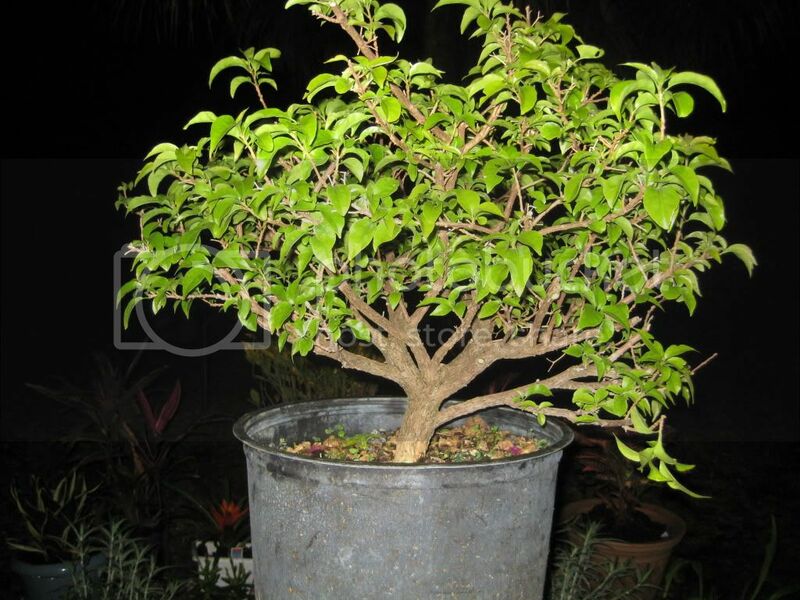 I know there are several forms of bonsai and there are many styles from various cultural influences. 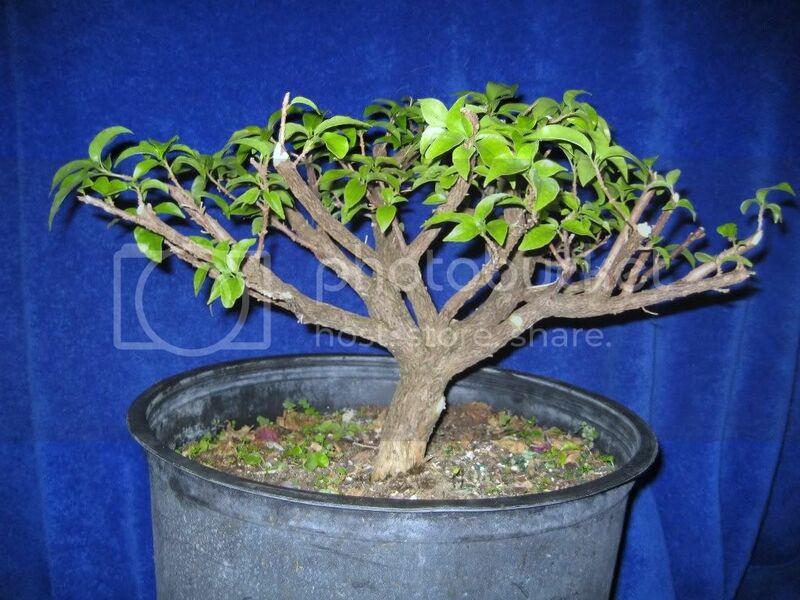 Some of them I am struggling to appreciate right now and maybe it is just my personal preference as I am sure all bonsai growers have their favorites. 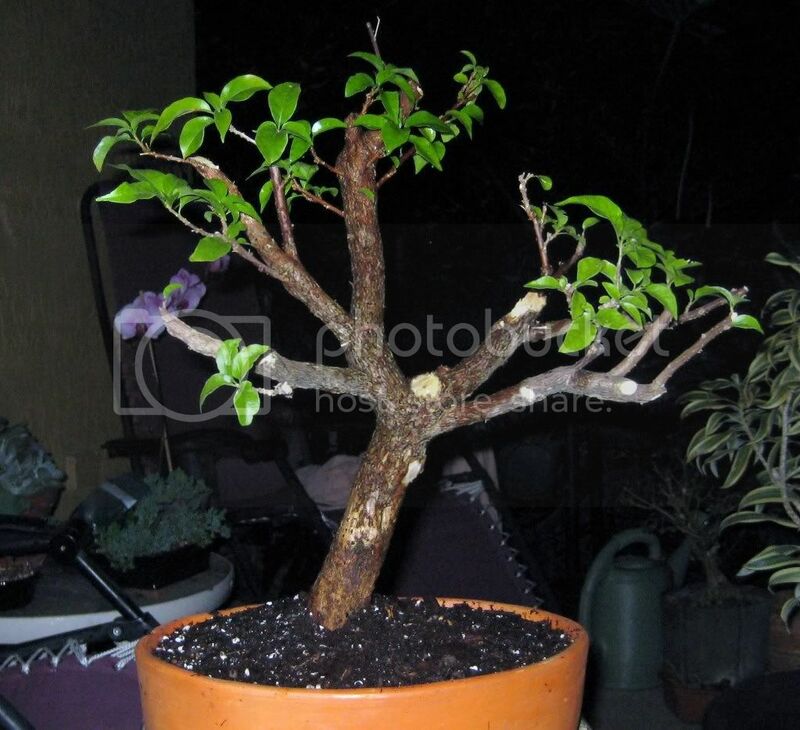 I found that I am still struggling to "see" what the bonsai wants to be or at least what others thought they should be. Overall it was a good and eye opening experience and not unexpected. You are getting some good advice here. And it is always good to get views from others, particularly in your club where they are familiar with the plants that grow well in your area. Listen to the voices of experience........then study and get your own idea of what you envision for your particular tree, going forward. It's your piece of are to create. I still don't like the lines. There are several areas of concern. I do not want to cut this all the way back but the symetry is off to me. I thought it would come together a bit for me if I put it in a pot. I still see the long section that forms the apex as non tapering and too long. I might cut that way back and hope for sprouting/budding near the tip. The two branches on one side are too close together and at certain angles they cross, depends upon which "front" is chosen. Since this is a fast growing specimen I am going to let it grow now in this pot and hopefully it will recover. New growth should add more possibilities. > Check to make sure the nebari starts where you assume it does. This one had recently been repotted and the trunk went several inches below the surface before roots were present which indicates to me it was moved from a 5 gal to a 7 gal pot sometime in the last few weeks. > I am sure that other things will become clear as I move forward - right now I am waning from my insomniac driven forum foray. I like your tree. 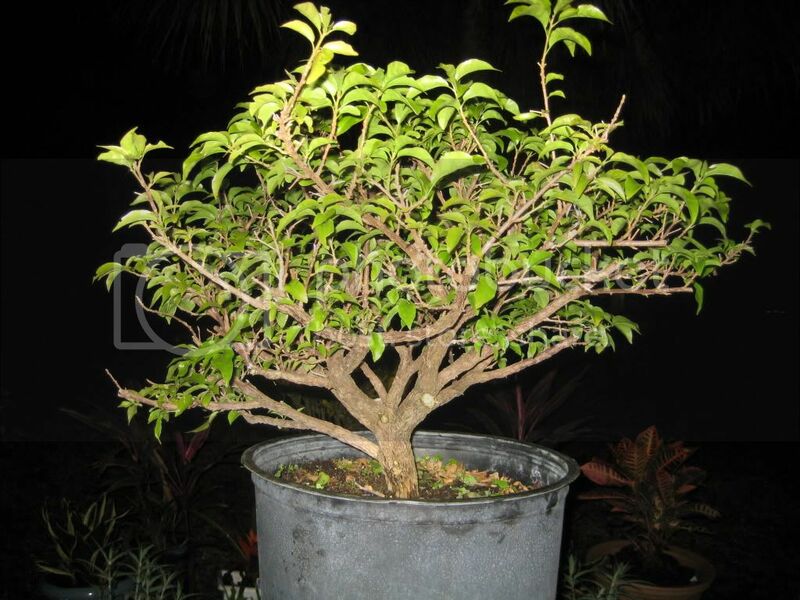 From your pictures it is difficult to determine which way branches are bending (to front or back - a 2 dimensional view). I think what is bothering you, like you say, is the strong thick trunk line to the apex. I would probably remove it. I would also use 'cut paste' on all cuts. This will aid in the healing and help blend the color so that the cut areas don't "stare at you" in the pictures. 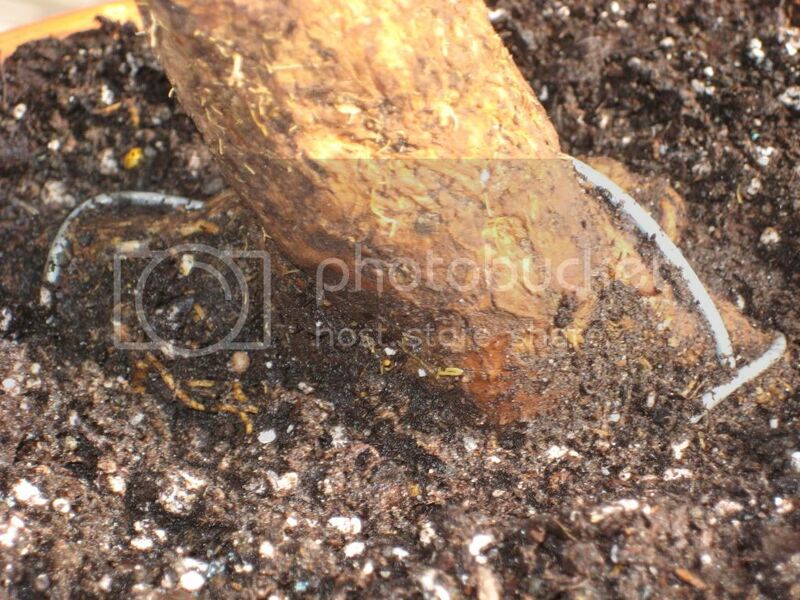 Could you remove more soil at the base line to reveal your nebari more? Nice start Scott. Now be patient. With a round pot you can turn your tree 360 degrees on your turntable until your tree reveals its best front. It WILL talk to you - you must listen. Last edited by TomM on Wed Mar 10, 2010 1:51 am, edited 2 times in total. There are some interesting nebari just under the soil line. I kept them covered for now to promote thickening. The pics from other angles to show the limbs are below. I have been looking for cut paste but all I have found is the "black tar" stuff that seems as if it will stain permanently. Do you have suggestions on where to buy this locally? Is it a putty? a paste? a liquid? applied by brush? formed by hand?, you know ....the "I ain't never heeerd of that there stuff before" directions. 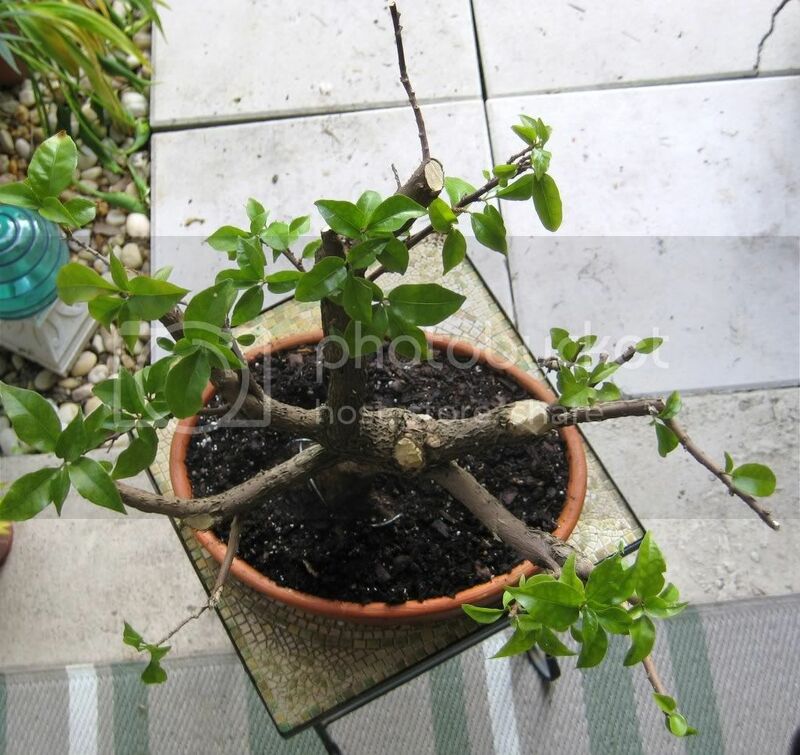 Oh, and you can see the nebari a bit as I brushed away some of the soil covering it. Notice I was forced to wire over it because the root structure was rather weak to support this weight of tree. 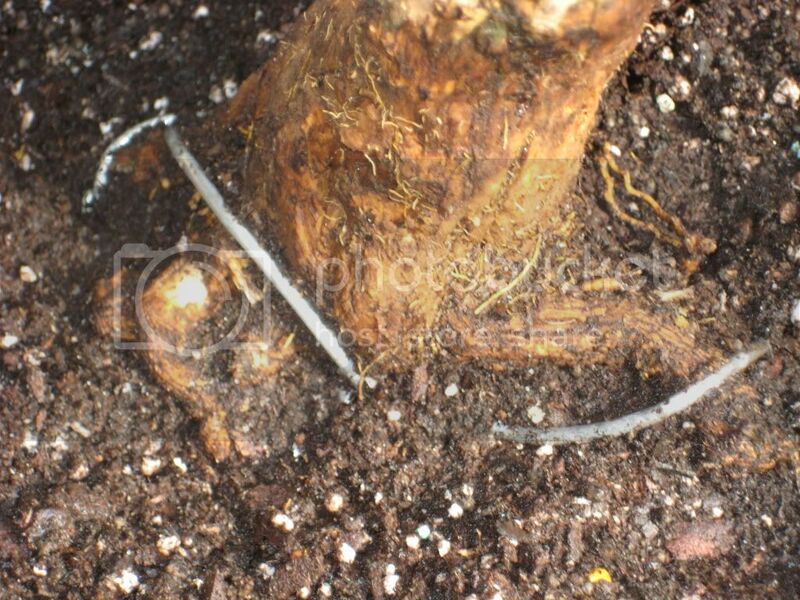 I mean wiring over the other roots was breaking them not supporting the tree. I don't like the fact that I had to tighten down on it some to hold it but I don't know what else to do, it has to be stable. tall nursery stock october maple, best way to proceed?